Will Congress Allow the Recovery to Continue? There is increasing evidence that the current economic recovery might be considerably stronger were it not for a number of congressional actions taken over the past year. In October 2011 I authored a paper examining the impact of the fiscal year 2011 appropriation measures passed by Congress in April 2011. The analysis showed that the continuing resolution may have destroyed more than 350,000 jobs—some in government but mostly in the private sector. Despite the strong advice of a broad spectrum of economists that the government should postpone deficit reductions until the economy was strong enough to absorb cuts without sacrificing growth, Congress did just the opposite. They slashed $45 billion from last year’s budget largely by deferring necessary expenditures—expenditures that we will be forced to make once we are in full recovery, and deficit reduction should be the order of the day. Concern was also expressed in a number of quarters that other congressional actions taken in 2011 may have placed the recovery in jeopardy. Most prominent among these actions was the debate over raising the debt ceiling and the uncertainty that it generated, not only with respect to whether or not the federal government would pay its debts but also in terms of the rationality of the policymaking machinery itself. The stock market certainly gave evidence to that theory. Despite assurances from most brokerage houses that Congress would reach a deal on the debt limit before the August 2 deadline, the 10 percent rally that the market enjoyed in the first four months of 2011 stalled in May and gave way to increasing volatility through June and July. 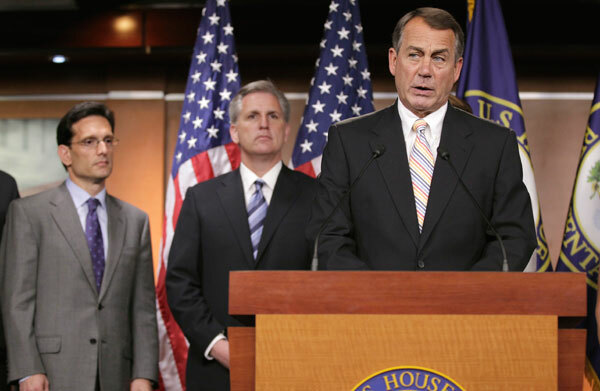 House Speaker John Boehner (R-OH) and President Barack Obama appeared close to an agreement at several points during the summer only to find strong opposition within the House Republican Conference. More than a few House Republicans opposed raising the ceiling altogether. Rep. Michele Bachmann (R-MN) wrote on July 29, “I remained firmly opposed to raising the debt limit.” Rep. David Schweikert (R-AZ) accused Treasury Secretary Tim Geithner of having “his hair on fire. … it’s absolutely silly. We have plenty of cash flow to pay debt.” And Rep. Ron Paul (R-TX) began running television ads against any debt ceiling agreement by midsummer. By July 22, with less than two weeks remaining before the deadline, the unease that had pervaded the markets since May began to give way to panic. Over the next six trading sessions, the Dow Jones Industrial Average dropped 581 points. Even after the House finally approved a compromise agreement on August 1, the market continued to drop and did not hit bottom for another nine days—falling an additional 1,300 points. Investors may have been grateful that the U.S. government came to terms with the necessity of paying its debts. But the fact that more than two-thirds of the 1,900-point decline took place after Congress struck the deal is a clear sign that many investors were more than a little taken aback by Congress’s grasp—or lack thereof—of economic fundamentals and the necessity of arriving at a compromise. While the stock market recently recovered from the decline that took place last August, a group of economic researchers at Stanford University and the University of Chicago recently found that Congress’s shenanigans last summer may have also done serious and lasting damage to the broader economy. To determine the level of uncertainty at particular points in time and the extent to which overall economic uncertainty was driven by concerns over government policy, they developed two indices—one for economic uncertainty due to all causes and the other for economic uncertainty due to policy. An important component in each index was the amount of monthly press coverage mentioning uncertainty with respect to the economy, as well as coverage that linked uncertainty to specific policy or nonpolicy concerns. Also included was the extent to which economic forecasters were at variance with one another in predicting certain types of economic performance one year into the future. The economists then tracked those indices over a 36-year time period beginning in 1985 and examined how the economy performed during periods following significant changes in the indices. They found that the level of overall economic uncertainty varied widely over the period, ranging from a low of about 58 on their index during the years leading up to the first Gulf War to a peak of 497 with the collapse of the venerable investment bank Lehman Brothers in the fall of 2008. Government policy concern was always a large factor in overall uncertainty, but it was far more important at some points in time than at others. Policy accounted for only a little more than 40 percent of total economic worries in the mid- to late-1990s, when overall uncertainty was measured at 92. But concern over policy shot to an all-time high during last year’s debt limit debate, accounting for 77 percent of all uncertainty, which rose to 442—the second-highest level for overall uncertainty in the entire 36-year period. 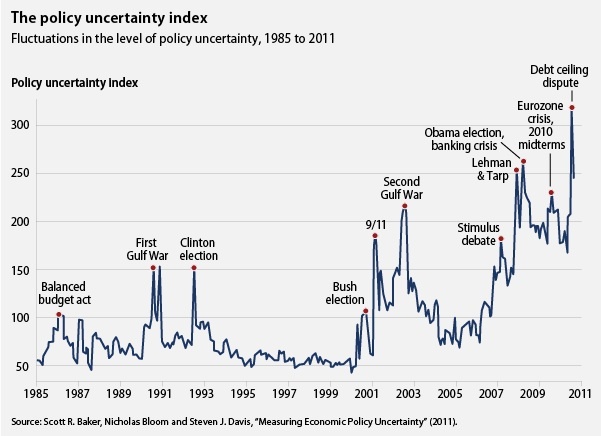 Total uncertainty last summer was much higher than during either Gulf War and in the weeks following 9/11—it even approached the levels of concern following the collapse of Lehman Brothers. In other words, it was a very big deal. 124 point rise in policy uncertainty (the rise in our policy uncertainty index from 2006 to the first eight months of 2011) is followed by a persistent fall in real industrial production with a peak negative impact of about -4% at 16 months. Similarly, there is a persistent fall in aggregate employment following a policy uncertainty shocks, with a peak response of 2.5 million jobs after 24 months. These dynamic responses are substantial, lending support to recent concerns about the potentially damaging economic consequences of policy uncertainty. As the graph taken from their paper illustrates, the increased policy uncertainty that resulted from the debt ceiling debate represents more than half of the overall increase in policy uncertainty between 2006 and 2011. (see Figure 1) Extrapolating from their analysis that a 124-point increase might be associated with a 4 percent drop in output and a loss of 2.5 million jobs, the increase in uncertainty resulting from the debt ceiling debate may well have accounted for more than a 2 percent drop in industrial output and more than a million lost jobs. This analysis may be important in terms of understanding where we are and why we are here, but it is far more important in terms of understanding the impact that future uncompromising political confrontations can have on the broader economy and on our ability to generate desperately needed jobs. Demonstrating competence and a willingness to compromise in a timely manner for the common good may be good political style and critically important to rebuilding the nation’s economic confidence.